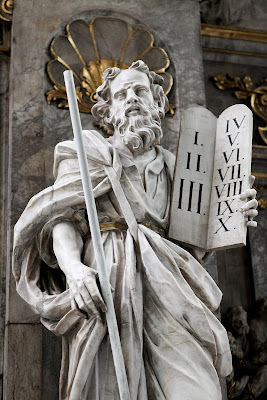 Christian Capitalism: How high can profits go? The market set new records this week. Some of the lift came from the European Central Bank printing new Euros. As the ECB buys bonds, the sellers are buying into the US stock market thinking that it is the safest repository. The ECB printing presses will impact stock markets for six months then, like any drug, the effect will begin to wear off. In microeconomics that’s called diminishing marginal returns. 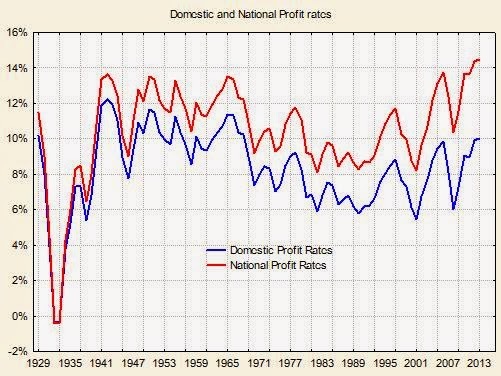 The graph to the left shows profit rates from US domestic only earnings plotted in blue and labeled “Domestic Profit Rates” with the domestic profits that include foreign earnings plotted in red and labeled "National Profit Rates." The data comes the NIPA tables at the Bureau of Economic Analysis. Domestic profit rates are at their highest since 1965, but national rates are at their highest level on record. The high level of profits, and the records in the stock market in spite of a relatively sluggish economy, emphasizes the growing importance of foreign earnings. Albert Edwards, the market's favourite bear at Societie Generale, wrote last week that the rte of decline in analysts' forward profit expectations in the US is clearly associated with recession. According to MSCI data, profits downgrades are exceeding upgrades by a net 33 percent at present. Some of the decline in expected earnings comes from falling oil prices and much of the rest from the rising dollar that reduces earnings from overseas. Bespoke Investment Group (BIG) calculates the “guidance spread” each quarter, which measures the difference between the percentage of companies raising guidance and lowering guidance; so when the number is negative, more companies have lowered guidance than raised guidance. The spread for the most recent quarter came in at a “ridiculously low” -9.4 percentage points. That was the lowest guidance spread since the final two quarters of 2008, at the end of the financial crisis. Psychologically speaking, pessimism like that coming out of the financial press is good for the market. If predictions turn out wrong and profits surprise by rising the market will soar. On the other hand, it's hard to see where earnings growth will come from. Eventually, profits will fall as the Ricardo Effect kicks in and when it does the stock market will collapse as it did in 2000 and 2008.